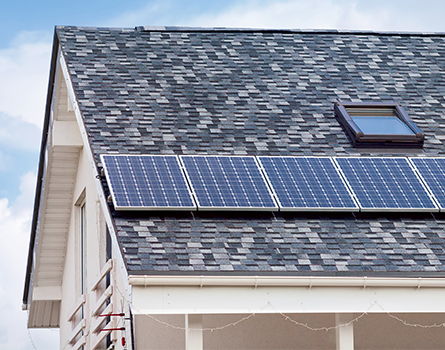 Switching to solar power can be easy and affordable. At Anasazi, we handle the entire process, from the initial site survey to the final installation. We even help our clients fill out paperwork for rebates and tax credits. Contact us to discover how easy it can be. Find out how much you will save with a solar PV system. We offer a free site survey and estimate with no cost or obligation. We also perform energy audits and sit down with you to determine the right system for your needs. This process lets us tailor a design for your property, optimize our proposal, and provide accurate and competitive estimates. With a solar PV system, most clients will save $5 for every $1 they would spend by simply conserving energy. Whether you want to go completely off-grid or supplement your existing heating with a solar thermal system, we deliver the right solution for your home. With a grid-tied solar system, you'll have your very own power plant. Any excess power will feed clean, renewable energy back into the grid and make your meter spin backward, allowing you to partially or fully offset your power bill. Grid-tied systems are more affordable than off-grid systems. No storage batteries are required, and renewable energy credits are available. Grid-tied systems integrate seamlessly with your utility and operate silently. They require little or no maintenance and last for 30 years or more. Most systems can be installed on roofs, but ground- and pole-mounted systems are also available. Build where the views are best, regardless of power line availability. An off-grid solar PV system gives you dependable, quiet, affordable electricity at any location. The cost is usually much lower than that of installing transmission lines, and solar system won't spoil your view. You'll enjoy complete energy independence with no monthly power bills. Most off-grid clients also have a backup generator. This helps decrease the size of the solar system and caters to high-demand times. If you're throwing a party or hosting guests, the generator will automatically kick in to top off your battery bank. Off-grid systems are also scalable to meet changing energy needs. Solar thermal provides an easy way to supplement your existing heating system. We use nontoxic glycol in either closed-loop or drain-back configurations, so you never have to worry about your system freezing. Plus, it is completely isolated from your existing system by heat exchangers, so you don't have to worry about glycol getting where it shouldn't be. Solar thermal is ideal for homes that use hydronic (hot water) heating or in-floor heating. If you have a forced-air furnace, heat exchangers can be installed in your existing ductwork.